Caught by the watchful eye of TotalCarScore.com, we once again find ourselves glancing at the next-generation 2014 Cadillac CTS — two of them — with less camouflage than ever before. 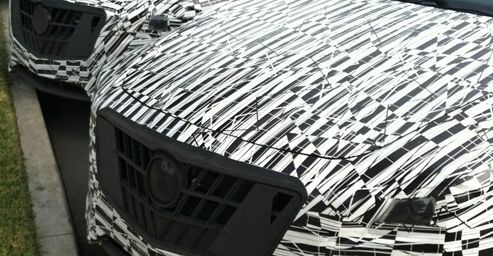 And while we’ve come familiar with the look of the vehicle’s exterior, we finally get a few close-ups of the cabin. The interior appears to follow suit with what we can currently find in the ATS and XTS sedans, and you can take it to the bank that there is a CUE system under that black tarp. Notably, there’s something new here: an “M” button on top of the automatic shift knob. It has to stand for “manual” mode, where the driver would then be able to select the gears via the manual shift levers on the steering wheel. While TotalCarScore.com speculates that these twin Cadillac test mules are examples of the next-generation CTS-V, we’re not too certain it’s the case. For one, the seats shown in the interior shot do not appear to feature the type of aggressive bolstering that we’ve seen with the Recaro seats in the outgoing CTS-V. Nor do we see any swelling of the hood, suggesting any sort of leviathan power plant that a vehicle like this would require. And while it’s very hard to tell, the tires don’t seem like the type that would be on a successor to a 556-horsepower monster. Sure, there are plenty of subtle “V” design cues, such as the grille and angles on the mirrors, but that’s hardly any indicator upon further inspection. Maybe a twin-turbo V6 lays under the hoods of these vehicles, but unless the engine is good enough for 550-plus horses, it’s certainly not V-worthy. To see a full gallery with the interior shots, visit TotalCarScore.com. I wonder if the test driver left the car unlocked. How else would they have gotten the hood open? Shots of the brake rotors probably would have been a better indicator if these were V-models as opposed to looking for hidden styling cues. No v yet.. though gm already said the v will carry on with a supercharged v8 the new “lt4” a supercharged lt1..
Frankie, did GM say that? When and where? I hope the CTS can actually outclass the Audi A-6, BMW 5-series and Merc E- class, in performance and driving dynamics.